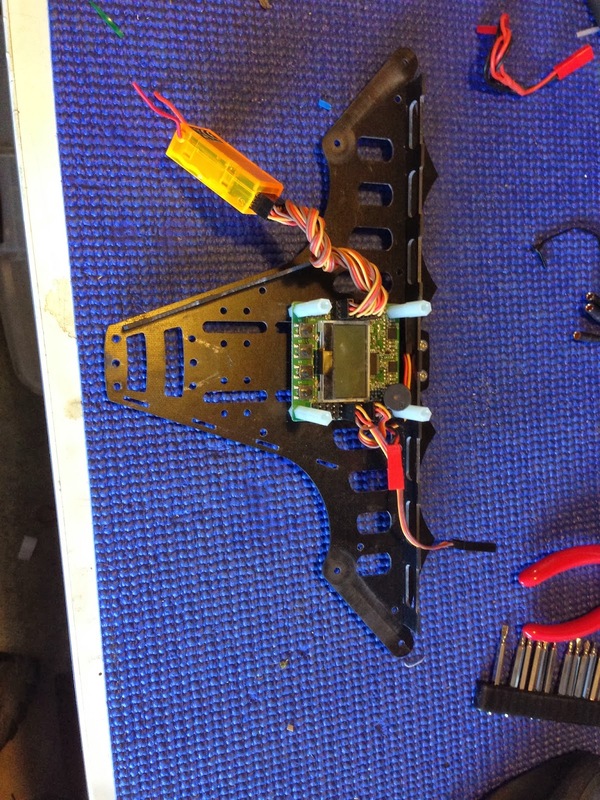 A flitetest article I did on my small Tcopter build. You have some days where you should just give up. I had one of those on Sunday. I have a chance to go and fly in a park. So I decided to take only the tricopter and try to get some footage. I packed the Tri up in the car with the camera and 5 batteries. Trundled off to the park, get all set to fly.. start the camera. NO SD card .... grrrr. Oh well lets go for a fly anyway. Flying very happily and then with the Tri about 100 meters away I lose orientation of the tri. I try to figure it out but Im only getting further away. I decide to try and land. Well the landing ended up been a lawn dart as the below picture shows. This was all on the first battery. I should have stopped there. But no I went back and got the quad, and the SD card to try and fly again, in a different spot. I had a few glitches with the gimbal initialising, but finally got it sorted and took off for a the first flight. All going well, doing a sweeping turn see lamp post, mental note don't hit it. Carry on the turn smack right into the bloody lamp post. I could not believe it. I normally would not have been able to hit it even if I was trying. 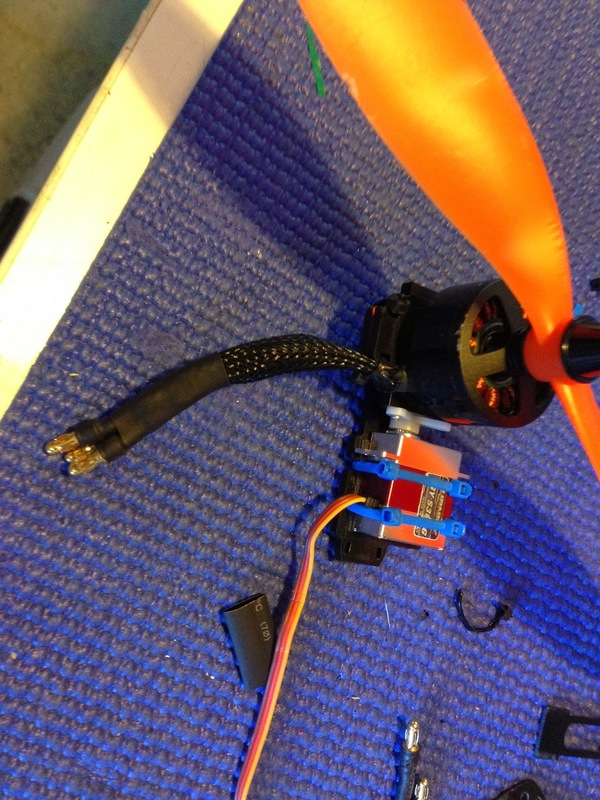 So another broken bird, and yes that to was on the first battery. Picture of the nasty pole that jumped out and attacked my quad !! Broken props, still need to test everything else. Video evidence of my stupidity.. idiot !! So I now have 2 broken multirotors to fix. 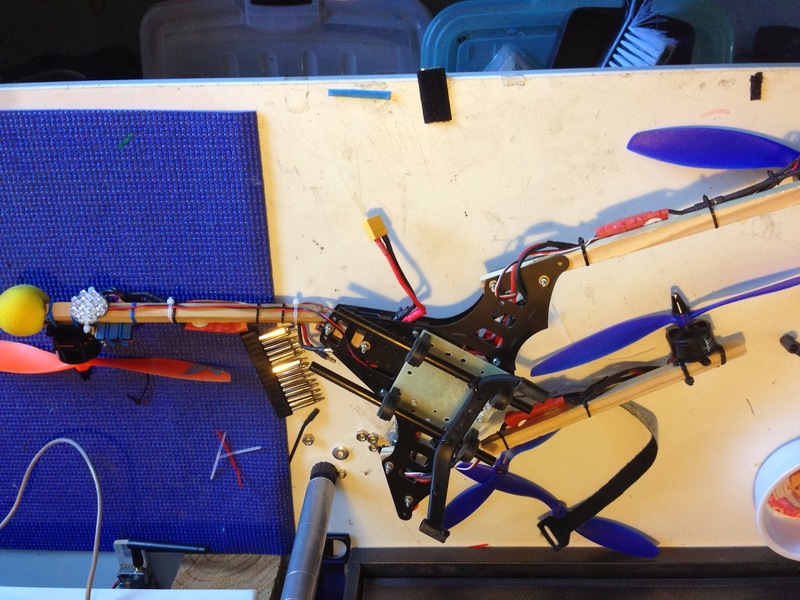 After the above lawn dart landing / crash I decided to rebuild the tricopter. 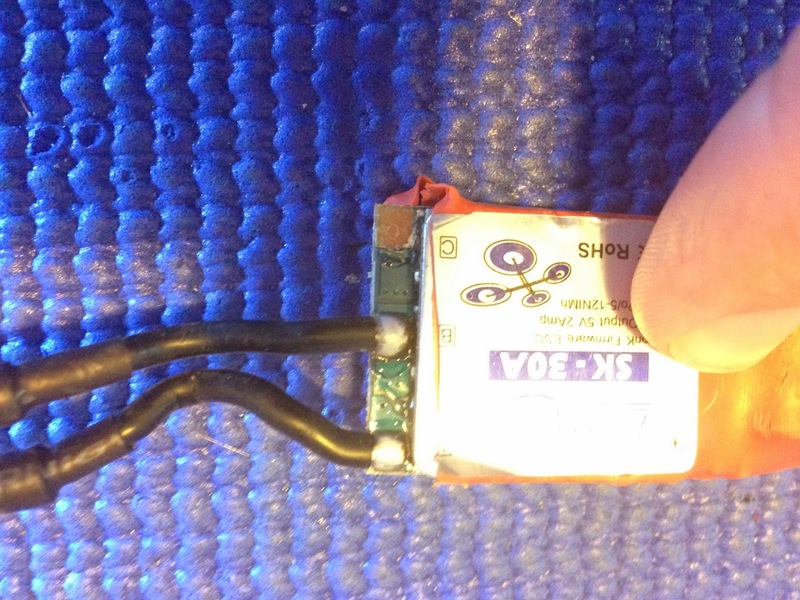 This is the second time in a crash that a motor wire has pulled right off the ESC board. So in the rebuild I wanted to protect them better and also centralise the weight to the body to make broken arm repairs easier. The rebuild begins, complete tear down. Damage that the ESC sustained in the the crash, this is the second that has broken this way. I have now hot glued around the wired and inside the heat-shrink to add some strength. The ESC are also now in the frame and not on the arms and I have tried to remove any force been applied to the motor wires. This time all wiring is covered in plastic mesh. 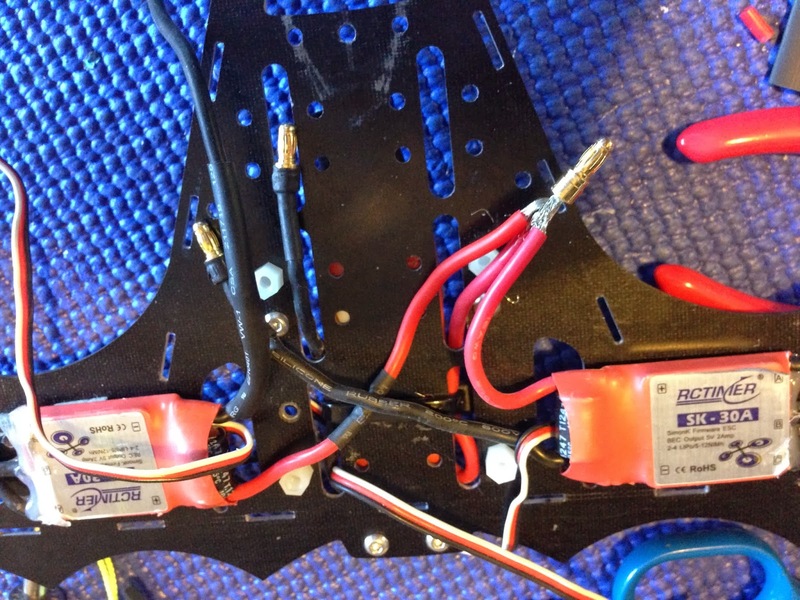 Custom wire harness to help reduce weigh and simplify the wiring. ESC's now in the body, meshed patch leads from the motor to the SC to hopefully protect both in a crash. I also found that I had broken the rear servo, and internal shaft had sheared. Luckily I have some that I had ordered for my simple Tcopter. They are larger ones, so hopefully stronger. I have to used the yaw from the simple Tcopter as the fortis yaw mechanism is setup for smaller servos. All finished, much tidier and lighter than before. it will be interesting to see how the rear servo lasts.